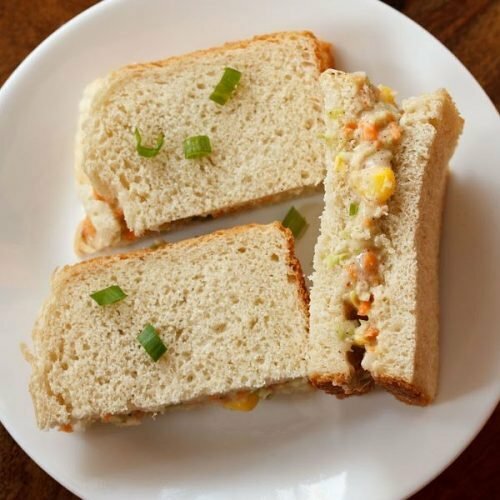 veg coleslaw sandwich recipe - quick to prepare sandwiches with veg coleslaw. first rinse and finely chop the veggies in a food chopper or a food processor or with a knife. you will need ¼ cup finely chopped cabbage, ¼ cup tightly packed finely chopped carrots, 2 tablespoons finely chopped capsicum and 2 tablespoons finely chopped spring onions or onions. also add ¼ cup boiled or steamed corn kernels. you can skip corn if you want. then add ¼ cup mayonnaise, ¼ to ½ teaspoon black pepper powder, a pinch of salt and 1 teaspoon sugar. add sugar and black pepper powder as required. then add ½ teaspoon lemon juice. if you want, you can also add some red chili flakes or some dried herbs like oregano, thyme, basil. mix everything very well. check the taste and add some more salt, sugar or black pepper if required. take the bread slices and spread some butter on them. this is an optional step. now spread veg mayonnaise stuffing on the bread slices. place on top the remaining buttered slices and slice the coleslaw sandwiches. serve coleslaw sandwiches plain or accompanied with some french fries.